An early promoter and populariser of Darwin’s evolutionary theory, the German biologist and artist Ernst Haeckel was a hugely influential figure of the late 19th century. 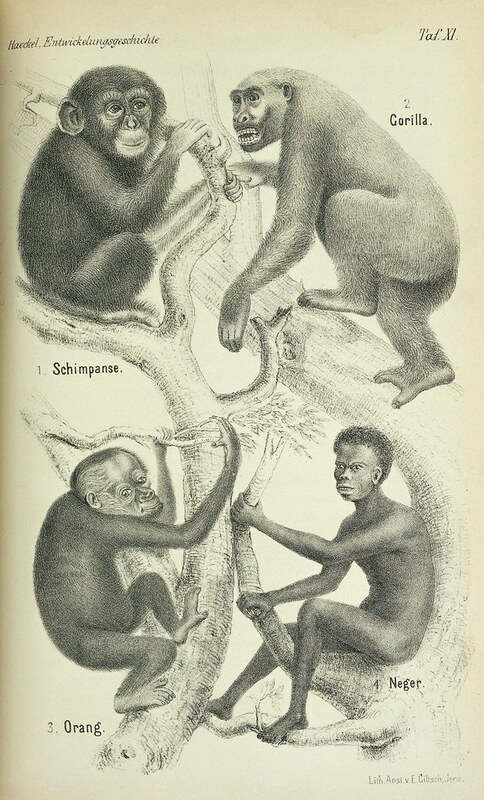 Bernd Brunner looks at how a trip to Sri Lanka sowed the seeds for not only Haeckel’s majestic illustrations from his Art Forms in Nature, for which he is perhaps best known today, but also his disturbing ideas on race and eugenics. 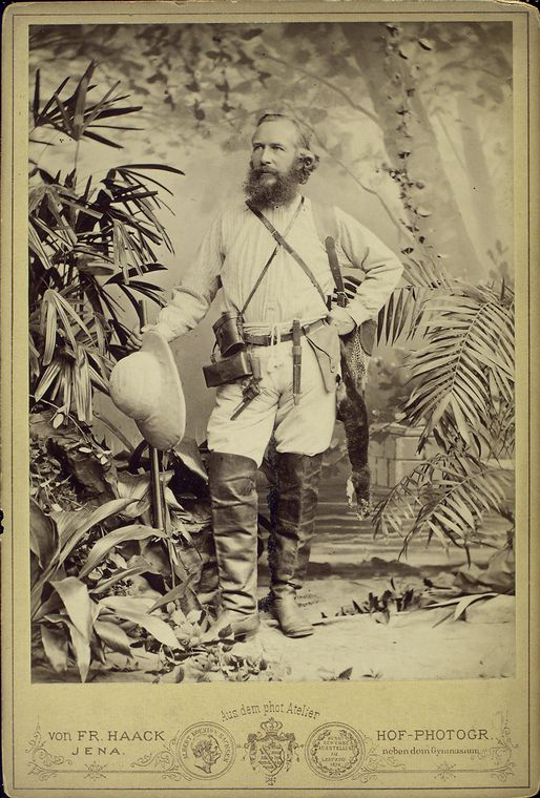 Studio portrait of Ernst Haeckel in his tropical explorer’s gear, date unknown — Source. Ernst Haeckel and his sixteen steamer trunks arrived at the harbor of Colombo “in the glorious light of a cloudless tropical morning” on November 21, 1881, after a four-week journey via Trieste, Suez, Aden, and Bombay. The zoologist had high hopes: during the coming four months in Ceylon — now Sri Lanka — he planned to get to know flora and fauna in “that highest and most marvellous variety of form” which existed on the island. Haeckel’s enthusiasm was understandable: he was literally entering the promised land of his naturalist dreams. Admittedly, Ceylon at that time was not defined by dream beaches, a devastating tsunami, or decades of conflict between the country’s Sinhalese and the Tamil inhabitants — all topics we commonly associate with Sri Lanka today. In Haeckel’s era, the teardrop-shaped island nation off India’s southeastern coast embodied the concept of “the tropics”. It was a place of paradisiacal plenty bursting with things that were unfamiliar and often brilliantly colored: animals, plants, fruit, spices, and even gemstones. The realm of riches seemed like a dream world from another time. It was also a land of extremes, where the heat and humidity provided fertile conditions for a host of dangers — little-understood diseases that could quickly turn life-threatening, plagues of insects, predatory animals stalking through the thick vegetation, sharks swimming offshore, and torrential downpours. As he later recalled in his book A Visit to Ceylon, Haeckel planned to trade “the restraint of our artificial social life” for an existence “in the midst of the simple children of nature . . . forming some conception of that visionary primeval paradise into which the human race was born.” After all, he believed that humanity had originated near Ceylon on the hypothetical continent of “Lemuria” in the Indian Ocean. This conviction certainly influenced his decision to travel to Ceylon — along with the fact that his role models, Alexander von Humboldt and Charles Darwin, never made it to that corner of the world. Chromolithograph by W. Koehler, after Ernst Haeckel’s 1882 painting “World’s End”, printed in Haeckel’s Wanderbilder (1905) — Source. For Haeckel, at the time forty-seven years old and the most important champion of Darwin’s theory of evolution on the European continent, the journey to Ceylon represented the fulfillment of a long-held but initially vague desire that took concrete shape over many years. “As an eight-year-old boy, I loved no book more than Robinson Crusoe,” he once recalled, “and a lonely life in nature on a distant island played a large part in many of my childhood fantasies.” It’s clear that he caught his tropical fever early, and that it intensified over decades. But his journey was also motivated by immediate scientific concerns. Five years earlier, Britain’s Challenger expedition had ended. Despite its global aspirations, this trailblazing contribution to marine research neglected the Indian Ocean. Haeckel did not take part in the voyage, but he was later commissioned to study and classify the Radiata specimens — such as jellyfish and starfish — that had been collected. Haeckel wanted to add several chapters to the resulting report. In the end, he had a range of reasons for traveling to Ceylon: a longing for adventure he had nourished since childhood, scientific ambition, and — when we keep the illustrations he would later create in mind — artistic ambition as well. 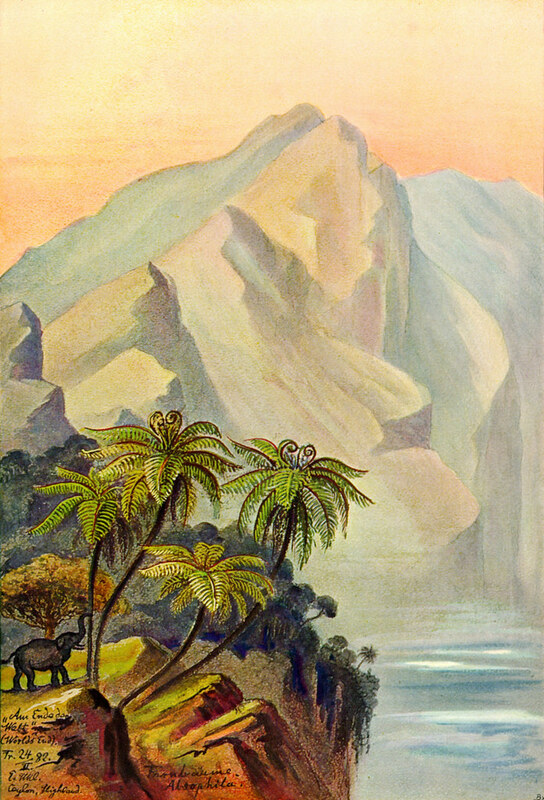 Chromolithograph by W. Koehler, after Ernst Haeckel’s 1882 painting depicting a jungle scene on the Kelany-Ganga (Kelani River) in Ceylon (present-day Sri Lanka), printed in Haeckel’s Wanderbilder (1905) — Source. Once Haeckel reached Ceylon, however, it was the island’s rich gardening culture that first drew his attention. “Often I have fancied myself in some beautiful wild spot with tall trees on all sides, wreathed and overgrown with creepers”, he wrote. “But a hut shrouded under the branches of a bread-fruit-tree, a dog or a pig trotting out of the brushwood, children at play and hiding under the caladium leaves, have betrayed the fact that I was in a native (Sinhalese) garden.” The ecology of these practical gardens, known as gewattas, has only been investigated closely in recent decades. The seemingly chaotic mixture of trees, bushes, vines, and herbaceous underbrush is actually a symbiotic system in which each element has a place and fulfills a purpose. Cultivated using low inputs of labor and fertilizers, they are amazingly productive, especially when the full range of their bounty is considered: from firewood to food and spices. Sri Lanka is home to a surprisingly diverse array of environments: from dense tropical rainforests to coral reefs, from tidelands to savannahs, from mangrove forests to sand dunes. Haeckel set to work familiarizing himself with almost everything they contained. He was especially impressed by the palms, those “princes among plants”. In the hills whose lower stretches were covered with meadows and rice fields, he discovered thick brushland where the trees “have grown up without any kind of order, and in such wild confusion — so tangled with creepers and climbers, with parasitic ferns, orchids and other hangers-on, every gap closed with a compact network of bush and brake — that it is quite impossible to unravel the knot and distinguish the closely matted stems.” According to Haeckel, simply taking a few steps into this tangled growth was a dangerous undertaking. He recalled being attacked by mosquitos, bitten by ants, and plagued by all the nettles and thorns deployed by the plants to “bar the way into their mysterious labyrinth”. It was here that Haeckel first glimpsed the magnificent Gloriosa superba, “the poisonous climbing lily of Ceylon, with its golden-red crown”. Large black apes and swarms of green parrots surrounded him, and he killed “an enormous lizard above six feet long (the singular Hydrosaurus salvator)” — a creature resembling a crocodile — with a shot to the head. He also encountered the talipot tree or “century palm”, with its tall trunk like a slender marble column. The talipot blooms just once, usually between the ages of fifty and eighty, when a pyramidal bush composed of millions of yellowish-white flowers emerges from its crown. Chromolithograph by W. Koehler, after Ernst Haeckel’s 1882 painting depicting screwpine on the south coast of Ceylon, printed in Haeckel’s Wanderbilder (1905) — Source. When Haeckel spent four days at the botanical garden of Peradeniya — located near the center of the island, on the outskirts of the former royal city of Kandy — he recognized the place as “an admirable natural forcing-house” and considered it the heart of the horticultural paradise that was Ceylon. But while the garden was and is a remarkable place, Haeckel’s most surprising experience on the island took place outside its confines. Setting up a zoological laboratory in Weligama, on the island’s southern tip, Haeckel set off to explore the nearby waters. Some of these excursions were short trips to cull specimens from the ocean’s surface, but at times he also sailed out for up to four hours in a traditional boat. Once he arrived at his destination — a point forty or fifty nautical miles from the shore (south, towards “Lemuria”) — he busily collected jellyfish and larvae. His supply of specimen bottles was quickly exhausted. But despite the wealth of sea life he found, his study of the specimens strengthened his conviction that the life forms existing in the earth’s various oceans resembled one another much more closely than the land creatures from continent to continent. Haeckel set aside the last month of his stay to explore the island’s high-altitude regions. His goal was to visit “the wildest parts of the primaeval forest” beyond the reach of human civilization. One spring morning he climbed through thick forests and past rushing streams and waterfalls to the top of the eight-thousand-meter Pidurutalagala, the highest point on the island. There were surprises in store, including five-foot-long sky-blue earthworms, the brilliantly colored woodcock, and a type of ash-gray monkey. On the Horton Plains, a primarily jungle-covered area that is now a national park, fresh piles of dung signaled that wild elephants were nearby. During the days that followed, Haeckel and his companions traveled through the tangled brush along so-called elephant trails. Unfortunately — or perhaps fortunately — they never actually encountered an elephant herd. 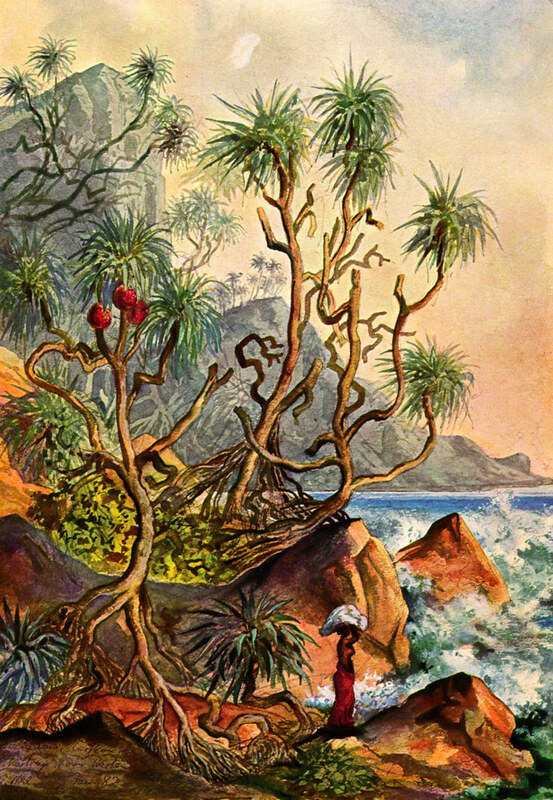 Chromolithograph by W. Koehler, after Ernst Haeckel’s 1882 painting of Nillu bushes and hanging bamboo in the highlands of Sri Lanka, printed in Haeckel’s Wanderbilder (1905) — Source. The Veddahs, or Vellahs, are commonly regarded as being the dispersed remnants of this race (hindoo); a few wild hordes still linger in the remotest parts of the interior and in the most primitive state. But, according to others, the Veddahs are, on the contrary, debased and degenerate descendants of the Cinghalese, outcasts that have reverted to savagery, like the Rodiyas. study the true beauty and proportion of the human form among these naturally developed models, than in the life-schools of European academies, where some model, found with difficulty among the degenerate sons of civilization and forced into some unwonted attitude, is but a poor substitute for the genuine child of nature. 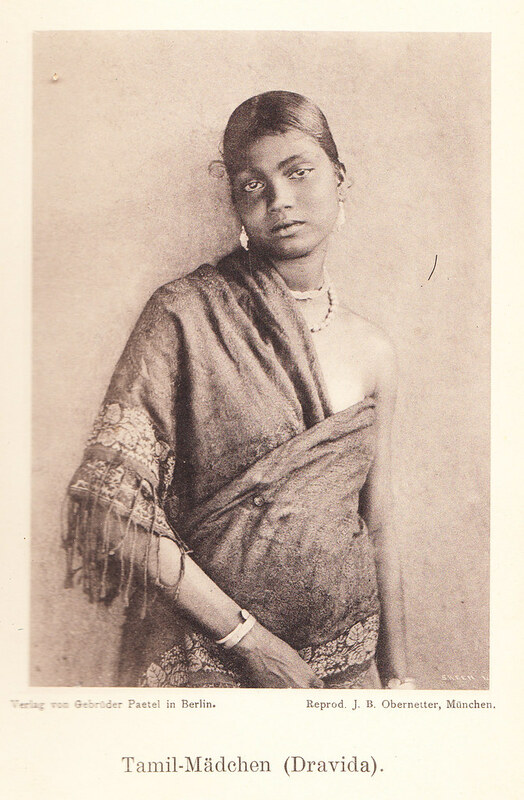 Photograph of a Tamil girl, featured in the third edition of Haeckel’s Indische Reisebriefe (1895) — Source: author’s own scan. On the other hand, Haeckel dismissively claimed that the “finely cut mouth” and “very dark, inspired-looking eyes” of the typical Tamil were deceptive, “promising much more than the brain within fulfills.” Wherever he was able to give his own preferences free rein, he indulged his weakness for classical Greek clichés. For example, he gave one of his four servants in Weligama the name Socrates. The lower-caste boy who opened coconuts for him each morning and fanned him with palm branches was dubbed Ganymede — after the youth who had the honor of serving the Olympian gods. We may ask ourselves why Haeckel did not use the boy’s real name, Gamameda. Wouldn’t it have been a matter of respect? Could he not see his young servant for who he “really” was? Or does today’s reader attribute too much weight to this question? That said, Haeckel can be credited with having formed closer relations with natives than with the European colonials — though this may in part have just been due to the fact that there were not many of the latter around. Haeckel returned to Europe in March 1882, taking thirty crates with him. 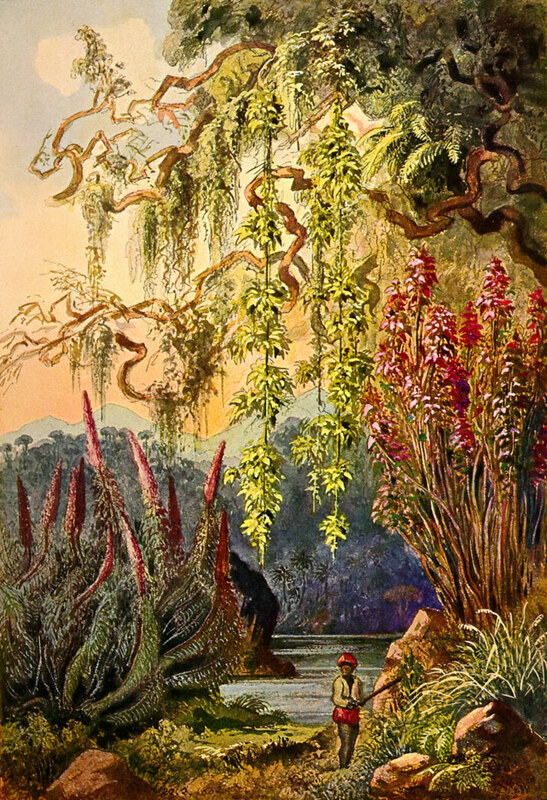 He later claimed that his triumphant arrival back in Europe could “only be compared with that of a soldier returning after a victorious campaign.” Although this first voyage to tropical lands did not lead to any research breakthroughs as such, his contact with its flora and people surely inspired Haeckel in the two main branches of activity for which he is known today. On the one hand, in the botanical and zoological bounty of Ceylon we can see the seed for the work by which he is perhaps best remembered, the splendid Art Forms in Nature, which he began publishing in 1899. The book’s complex, ornamental lithographs and halftone prints bridge art and science and continue to exert a particular fascination. Glowing with color, they brought the exotic and the remote to libraries around the world and were the culmination of decades of work for Haeckel. On the other hand is Haeckel’s work relating to race and eugenics, a side to his output certainly less palatable to a modern audience. Indeed, no matter how colorful and lively the descriptions of Haeckel’s travels may be, a shadow lies over A Visit to Ceylon. Haeckel’s legacy is not simply an appreciation for the beauty of nature. In light of the views that he later propagated — either in his writings or at his popular lectures — his travelogue seems tame and nearly innocent. But the complex constellation of attitudes that he developed over time and embodied does not fit easily into current categories of left and right and deserves a closer look. In political terms he was what may be called a liberal nationalist. At the same time, he made isolated anti-Semitic statements. Even more disturbingly, he was also a proponent of racial inequality and believed that the races he understood as “inferior” were dying out in response to their contact with the more “civilized” races. The hardening of his views on the hierarchy of races that took place during the last two decades of the nineteenth century must be understood in this broader context. It was a period when the sciences were undergoing intense development and specialization. Haeckel was not working in a vacuum: racial anthropology was a popular area of inquiry and had a number of champions. The tremendous economic success of certain societies due to industrialization and colonialism provided scientists with a seemingly convincing argument for claiming the superiority of the “favoured races in the struggle for life” (Darwin) and cementing it in the public consciousness. At the same time, these circumstances do not absolve Haeckel of his personal responsibility. He was a man of his time, but he also bears a measure of blame. After all, he was far more than just a cog in the machine. As an extremely popular author — his The History of Creation was translated into all the major European languages — he played an active role in helping concepts regarding the inferiority of certain “races” to spread and have an impact. In his view, “cultural value” determines the value of human life itself: he saw an unbridgeable chasm between the “thinking soul of the cultured man and the unthinking brutish soul of the savage, natural man” — a soul he compared to that of a dog. In his lecture on the origins of humankind at the Fourth International Zoological Congress, held in Cambridge in 1898, he discussed the Veddas as “Ceylon’s dwarf-like indigenous people”, who in his view were one step beyond humanoid apes. He even claimed that the distance between advanced European peoples and “savages” was greater than that between the latter and apes. His views later found an enthusiastic following among scientists who expounded racial theories to support National Socialist ideology. Illustration of the “Tree of Evolution”, from Haeckel’s Anthropogenie (1874) — Source. Equally troublesome is his stance on eugenics, which is light years removed from any ethically defensible standard today. His beliefs in this area transgress the purely descriptive limits of evolutionary theory to embrace the philosophy of the social Darwinists. Yet he did not merely echo their literal, limiting interpretation of the notion of “survival of the fittest” but took this chain of reasoning a fatal step further. Haeckel repeatedly cited the ancient Spartans in his defense of the killing of disabled infants, whom he considered to be of little or no value. Eugenics and euthanasia were embraced by many secular social reformers at the time, including some socialists. However, most of these thinkers advocated reproductive control for those they considered “inferior”, not their murder. But Haeckel did support killing, and he had a clear idea about where to draw the line between who was “worthy of living” and who was not. After his death, others followed who were no longer content with mere intellectual games. Adolf Hitler later claimed that it was actually more humane to kill disabled individuals than to allow them to live. To kill the disabled was seen as morally good, even though it overturned Judeo-Christian attitudes which protected the disabled. Haeckel’s works were widely read in the early twentieth century, and many eugenicists, racists, and anti-Semites absorbed the ideas they contained. 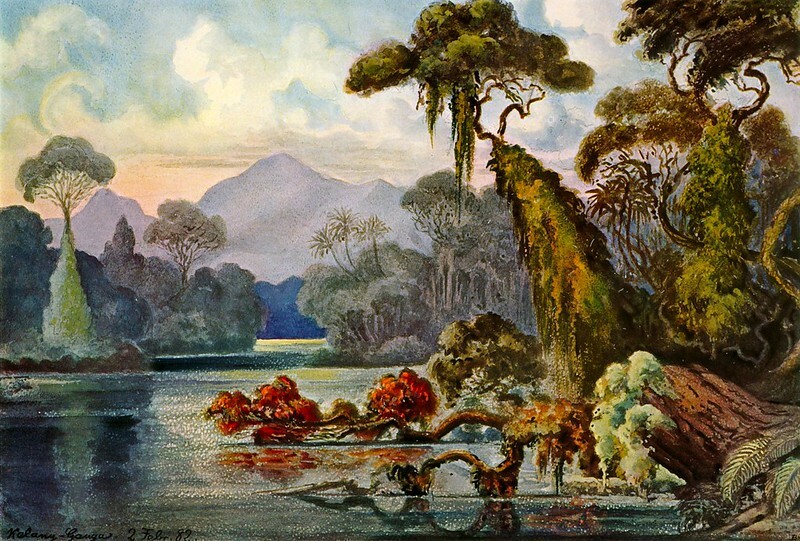 Close to two decades after his trip, in 1900, Haeckel set off for the tropics once again. Art Forms in Nature had just been published. This time, Ceylon was just a stop along a much longer route. Haeckel’s real destination was Southeast Asia: Java and Sumatra. It was unavoidable that this voyage lacked the excitement of his first trip, and it was no longer motivated by scientific ambitions. His observations in the resulting account of his travels read like the dutiful report of a researcher who, while he still had some capacity for wonder, was very set in his ways. His thoughts gravitated to humanoid apes and ape-like humans, leaving him little time for strolls through the coral gardens. A Visit to Ceylon (1883? English edition), by Ernst Haeckel, translated by Clara Bell. The History of Creation (1880 English edition), by Ernst Haeckel, translated by E. Ray Lankester. His artwork aside, Haeckel is better known as a divisive figure than as a pioneering biologist. Robert J. Richards’s intellectual biography rehabilitates Haeckel, providing the most accurate measure of his science and art yet written, as well as a moving account of Haeckel’s eventful life. Utilizing hitherto unexplored material that has become available only after the dismantling of the Berlin Wall, this book examines the Monist philosophy of the German zoologist Ernst Haeckel, and its role in stimulating the birth of Fascist ideology in Italy and France. A reprint, in English, of Ernst Haeckel’s groundbreaking Kunstformen der Natur. With the assistance of artist-lithographer Adolf Giltsch, Haeckel produced one hundred stunning plates, depicting his vision of an “aesthetics of nature”.